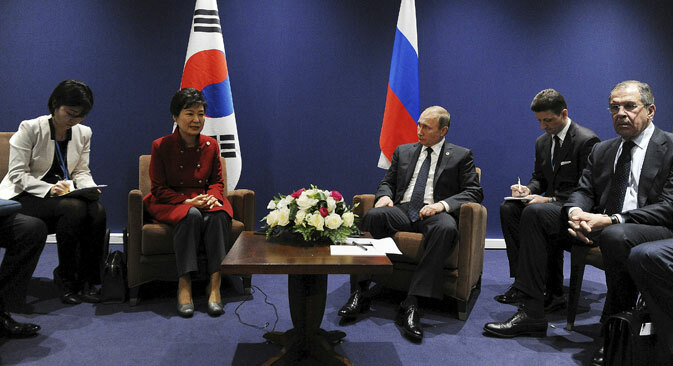 Russia's President Vladimir Putin (3rd R) meets with South Korea's President Park Geun-hye (2nd L) on the sidelines of the World Climate Change Conference 2015 at Le Bourget, near Paris, France. Park Geun-hye to take part in Eastern Economic Forum in Vladivostok. Russian President Vladimir Putin will hold a meeting with his South Korean counterpart Park Geun-hye on September 3 in Vladivostok, the Kremlin press service said on August 3. Park will visit Russia with a working visit and take part in the Eastern Economic Forum. The presidents "plan to discuss the condition and prospects of developing bilateral relations, including matters of cooperation in political, trade and economic, and cultural and humanitarian spheres," the Kremlin said adding the special attention "will be paid to pressing international and regional problems."